I just made the BEST salad ever. I was in a huge hurry though so I didn't have time to take a picture of it. This picture isn't the one I made, but it looks similar. And it is so easy to make. You really just have to throw it together. Just throw the lettuce in a bowl. 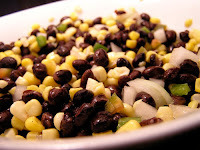 Warm up as many black beans and as much corn as you want. I found these 4 oz individual servings of corn at Wal-Mart that are awesome. They are Great Value brand, and a perfect size for a salad. All you do is pull back a corner and heat for 30 secs and its ready. I put the beans in a bowl and warmed it up for about 45 seconds. Throw corn and beans on lettuce. Then I cut an avocado, I use the whole thing because I love avocado, but you can use however much you want. I use big chunks though. Getting that huge seed out is tricky sometimes. Then I used the dressing. The dressing has corn and chunks of tomato and some other stuff in it, and it is delicious. If I were you, I'd definitely try this salad. It is SO EASY and SO GOOD!